Between freak and premium domain names there extends a vast sea of domain names representing varying value. How to recognise a domain name worthy of attention, and more money? Experienced investors recognize a good domain name in a flash, although they sometimes happen to have doubts. For inexperienced domainers, even help guides may be of no use. Domains, in a sense, are like works of art: to be able to properly assess the value of the “specimen”, you need to familiarize yourself with thousands of others. In addition to the essential characteristics generally attributed to good domain names, there is also something called “feeling”. It can be a number of “soft” properties, which may include the spelling, graphic design, scope of associations, and so on. These are the elusive elements of an address that can sometimes compensate for its more noticeable flaws, for example an excessive length. And vice versa – a domain with great design can be devoid of sense and aesthetic appeal. But rather than ponder “mystical” qualities of domains, let’s focus on more specific aspects and the most important features a good Internet address should have. 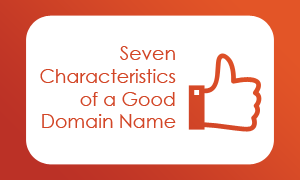 Let’s keep in mind, though, that not every domain name that has these properties is a guaranteed sales or branding success and not every domain that lacks some of these is a complete failure. This feature is repeated as dogma in all the texts referring to value domains. No wonder. Just look at the sales statement and see what addresses on them dominate. The shorter the domain name, the more selling power it has. Two- or three-letter names and acronyms prevail in the worldwide ranking of domains. A concise name is definitely a plus but the value of a domain is also determined by other factors other than brevity. It is now common knowledge that the appropriate country code TLD is essential for organizations doing business locally. The fact is that, large companies paying attention to their image focus on local extensions more than those from the SME sector. Despite the primacy of the .COM domain, the popularity of “alternative” national domain names, such as .CO or .ME has substantially increased. They might not beat .COM, but allow you to create a really attractive web address – both from the sales and branding point of view. Generic – a “Holy Grail” of domain industry. According to most domain holders, generic names have the greatest value, or nouns referring to a class of objects or concepts, such as sport, finances, art, etc. In fact, generic domains usually reach the highest prices in the secondary market. However, the value of a domain is often determined by cultural context, the native language or current market circumstances. For example, the two-letter domain FB.com would not be priced at the impressive 8.5 million dollars, had it not been associated with the famous social networking site. A meaningful “dry” term does not necessarily constitute a valuable and brandable domain name. With the exhaustion of generic names, domain enthusiasts and subscribers have begun directing their attention toward the names commonly referred to as “branded”. Such domain names often tend to be derivatives of dictionary terms and are sometimes neologisms. In contrast to the breakneck domain names, branded names have a limited number of characters and, at the same time, are aesthetically and linguistically appealing. Furthermore, such addresses have a significant market- as well as image-oriented value. Interestingly, the secondary market may not always appreciate the value of domains that can create a great brand name and often rewards less attractive but more specific domain names. An essential property of a good domain is how easy it is to recall it. Internet addresses are supposed to facilitate the communication between the sender (usually companies) and the recipient (usually the client). If the domain is complicated and difficult to remember, customers may not reach the web page because they’ve forgotten the address or may end up going to the site’s competition. A good domain name must be easy and memorable. A good address should be understandable not only in terms of clarity but also in terms of ease of delivery. The domain should be perceptible to the recipient both when it is pronounced and written. Complex combinations of letters or terms borrowed from other languages, even if they sound good or look good in the company logo, they will not always be easy to understand. As a result, Internet users can simply get confused and give up the search or be redirected to the site of competition. The trend of excessive readability has already gone into oblivion. Today, both the secondary domain market and the practice of branding show that the most valuable domain names are clear and free of unnecessary elements. This applies not only to hyphens but also other kinds of characters such as prefixes and suffixes, handy words like “online” or popular numbers such as 24. With the above pointers in mind, you can now think of creating your perfect domain name that will best suit your needs. With a wide range of extensions to choose from, generic, national or new gTLDs, you are sure to find the domain to meet your requirements. Just browse through the domains on offer and click on the domain of interest. You will then be able to check the name availability and learn more about the registration terms. Should you have questions or need assistance, please do not hesitate to contact us at support@web-solutions.eu or via phone on +44 (0) 208 133 3994.